It doesn't save me much time. I think I have spent more time setting it up, rescuing it from being stuck under furniture, returning it to its' dock, re-routing it after it repeatedly cleans the same room, uninstalling and re-installing the app, troubleshooting with customer service, and cleaning it after each use than if I would have vacuumed my floors with my traditional hand-held vacuum cleaner. A robot vacuum cleaner is a nice concept but I honestly don't think it has saved me any time and it is way more frustrating to use than my old vacuum cleaner. I use Rhonda to clean the first floor which is mostly hard surface. I have 2 dogs that shed excessively. I run Rhonda every day and she does a great job with dirt and pet hair. Only downside is that she sometimes dies before getting back to the charging station. Also, she tends to get stuck under the coffee table. We love it, just noisy, have to turn it on when we are not home or overnight. Cats love to watch and observe it move, fun time for them. When it cleans it does a great job, but has to clean for all 90 min, or spots will be missed. If battery dies, the robot will stop on the spot and have to find it and place back to dock, will not do it on its own. I have a Roomba e6, and I am very satisfy. 500 off valid on Roomba e5 Vacuuming Robots. Cannot be combined with any other offers. No adjustments for prior purchases. Discount will be applied at checkout. Offer expires at 11:59 PM EST on May 9, 2019. The Roomba®️ e5 robot vacuum features a premium 3-Stage Cleaning System that uses Dual Multi-Surface Rubber Brushes, Power-Lifting suction, and a high-efficiency filter to help thoroughly clean every day. The Edge-Sweeping Brush concentrates on edges and corners as intelligent navigation and Dirt Detect™️ technologies help the robot get around furniture and focus on areas that need it most. Control and schedule cleanings using the iRobot HOME App. When clean matters, you need a power-lifter. The e5's Power-Lifting Suction delivers 5X the air power*for improved pick-up performance. Ideal for homes with pets- Premium 3-stage Cleaning System cleans the dirt and pet hair you see, and the allergens and dust you don't. High-Efficiency Filter captures 99% of cat and dog allergens. Instead of bristles that bend and can miss dirt, our unique flexible rubber brushes hug different floor surfaces, staying in close contact with wood and carpet to help thoroughly clean your floors. Control and schedule cleanings on your Wi-Fi® connected Roomba® robot vacuum with the iRobot HOME App. You can monitor cleaning activity, view cleaning history, and watch maintenance videos. The app also updates your robot with the latest software, so it’s always up-to-date with new features. Want cleaner floors and carpets? Just speak up! All connected Roomba® robot vacuums are now compatible with Alexa-enabled devices and the Google Assistant to start, stop, or dock your robot. Amazon, Echo, Alexa, and all related logos are trademarks of Amazon.com, Inc. or its affiliate. All charged up, all on its own. Runs for up to 90 minutes* before automatically docking and recharging. Featuring these other Roomba® robot essentials- Wi-Fi® Connectivity, Edge-Sweeping Brush, Auto-Adjust Cleaning Head, Patented Dirt Detect™ Technology, Smart Navigation, works on carpets and hard floors. How do Roomba® vacuuming robots work? For a vacuuming robot to be effective, it not only needs to be able to clean well, but must have the ability to navigate real world homes. Roomba® uses a full suite of sensors and an advanced navigation system to seek out the dirtier areas of your floors and spends more time cleaning them. 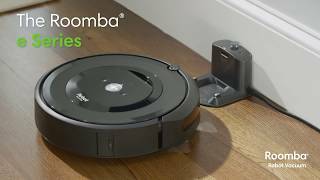 Will Roomba e5 work without using the iRobot HOME App? Yes, Roomba e5 can be used without the iRobot HOME App, but the App allows you to use your iOS or Android smart device to help you have the best possible experience with Roomba e5. With the iRobot HOME App, you can gain access to exclusive features including cleaning while away from home, managing your robot's cleaning schedule, customizing your cleaning preferences and more. Now compatible on devices with Amazon Alexa and the Google Assistant. How do Roomba® vacuuming robots compare to an upright vacuum? Roomba® can go places your upright can’t – like under most furniture to get dust bunnies and pet hair. It can also be scheduled to clean every day to stay ahead of dirt build-up. Can Roomba® vacuuming robots adjust to different floor surfaces? Yes. Roomba® automatically adjusts to clean carpets, rugs, tile, hardwood, and laminate floors as it moves through your home.